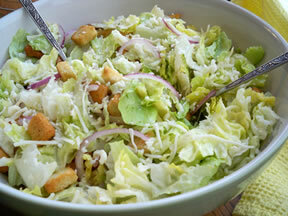 The homemade dressing for this Caesar Salad has a distinctive flavor that you will love. It just may become one of your family's favorite salad and dressing recipes. Mix all the dressing ingredients until smooth. Adjust seasonings to taste. 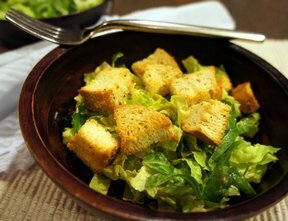 Tear romaine and iceberg lettuce into bite-size pieces. 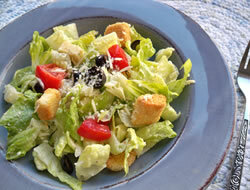 Toss the lettuce with the dressing and add croutons, tomatoes, olives, and Parmesan cheese as desired. 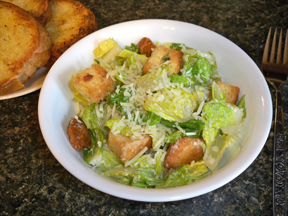 "I love Caesar salad but had never made my own dressing because so many recipes called for anchovies and that doesn't sound good to me but this dressing did not call for it. I thought it turned out great. I will have enough for a couple of more salads. I will definitely make this dressing again."